A resourceful gardener can create large features like raised beds or flower gardens without spending too much. Setting up and maintaining a garden is a constant investment. From seeds to materials to plants, it seems like there is always something else to budget for. While any gardener knows that the harvest is worth the monetary and physical investment, sometimes it’s a little overwhelming to find the supplies you need at a price you’re willing to pay. You’re not alone. The fact that gardening is a hobby shared by many means that there are myriad options for sourcing the new and used materials you might need. 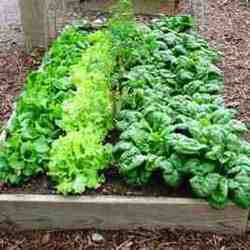 From flowers to vegetables, your yard likely either has, or will benefit from, raised beds. Not only to they create visual appeal, but they improve growing conditions, hold the soil in place, and suppress the grass and weeds that try to invade. When it comes time to build raised beds, you can always head directly to the lumber yard, but there are many other ways to find materials suitable for the job. For example, look for used materials that you can repurpose at your local Habitat for Humanity, online resale sites such as Facebook groups and Craigslist, or even estate and garage sales in your area. People might even be giving away wood or stones for free so that they don’t have to haul or dispose of them. For rustic appeal and free lumber, pick up some pallets from local businesses. They can be found in nearly every community and most businesses are happy to have someone haul them away. Use a Sawzall to cut the boards off or pry them apart and restructure them into a wooden garden box. Also keep your ear to the ground for someone tearing down a barn or ripping out a fence. Old wood makes a great material for raised beds. Of course you don’t have to go with the standard stone or wood-framed beds. Instead, use whatever you have or can come by easily. Some options might include chicken wire, plastic edging, or even a row of partially-buried wine bottles. Upcycling is still hugely popular and environmentally friendly, so finding ways to reuse materials is a great choice. Once your raised beds are in place, it’s time to fill them. 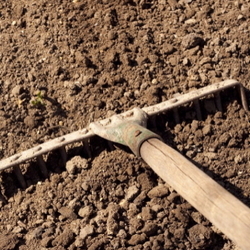 Starting with dirt, look for deals at your local garden center, especially during the early spring. Also look online for sellers who might not be as well advertised. Those a little further out of town are often less expensive and may even offer delivery. It’s almost always cheaper to buy dirt in bulk than per bag, but include delivery costs in your calculations, where they apply. 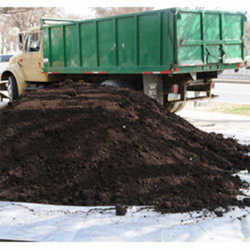 Compost can be found at many of the same locations as dirt, but consider making your own with an ongoing compost pile. Food scraps, grass clippings, and small twigs turn into nutrient-rich compost throughout the season, providing a source of food for your vegetable garden and flowers. You can build a compost bin out of lumber, order one online, pick one up at the local garden center, or even just make a loose pile. However you go about starting your compost, be sure it receives plenty of direct heat, water, and frequent rotation. Now comes the fun part. With your beds and soil in place, it’s time to fill them up with plants. Again, you could head to the home improvement store or garden center, but you will pay a premium for mature, in-season plants. Instead, consider starting from seeds a little earlier in the season with a greenhouse or indoor setup. Friends and family are another great place to track down plants. If you love your neighbor’s daylilies ask if you can divide a few out for your yard. Maybe offer a trade with something in your yard. Many plants divide well, but be sure to do it at the beginning or the end of the season in the best interest of the plant. Also provide adequate spacing between plants so they have room to spread as they grow. Your vegetable garden and flower bed don’t require a huge financial investment with the right planning and sourcing of materials. Propagate seeds from your plants at the end of season for use next year. For the best results, harvest heirloom, non-GMO varieties from healthy plants. You can also collect seeds from friends and neighbors. You can even gather seed heads on your nature walk and bring a bit of the wild into your yard. Be sure to properly dry and store your seeds for a successful growing season in the year to come. To maintain your well-planned and planted yard, you’ll also need a way to keep plants watered throughout the season. Start by collecting your own water in rain barrels. They are easy to install with a downspout diverter that will collect a percentage of your rain runoff. A spout on the bottom of your rain barrel makes it easy to attach a hose and run water to the flower beds. Speaking of hoses, gather old hoses from resale locations and garage sales. If you find that they have holes, drill some more and use them as soaker hoses for your garden. Put them on a timer for an easy water routine. You can also cut sections of old hose to wrap around saplings when anchoring them into place. Gardening should be a pleasant experience and inasmuch shouldn’t crush your wallet or your motivation. Scour the internet for online deals, peruse the local garden center, hit up Pinterest for ideas, and frequently check the free and resale pages to find the supplies you need.